At first, the claim that the Trump economic boom is nothing special seems contrary to the happy-talk headlines coming from CNBC, Fox Business, Bloomberg and other mainstream business media outlets. Those economic cheerleaders recite the stimulative effects of the Trump tax cuts and point to the Atlanta Fed forecast that second-quarter GDP will be 3.9% (as of the July 11 update). The Atlanta Fed estimate of 3.9% is in line with forecasts from National Economic Council head Larry Kudlow, Art Laffer (proponent of the eponymous Laffer curve), Steve Moore and others that say Trump’s programs will produce persistent trend growth of 3–4% or higher. There’s one problem with the happy talk about 3–4% growth. We’ve seen this movie before. Chart 1 below illustrates the fact that any signs of trend growth are strictly temporary (basically moving growth from one quarter to another through inventory and accounting quirks) and are quickly followed by weaker growth. In the first quarter of 2015, growth was 3.2%, but by the fourth quarter that year growth had fallen to a near-recession level of 0.5%. This pattern of temporarily strong growth followed by weak growth has been characteristic of the entire recovery that began in June 2009 and entered its 10th year last month. In fact, we’ve seen even more extreme reversals in the recent past. In the third quarter of 2013, growth was 4.5%, even higher than the Atlanta Fed forecast for the most recent quarter. 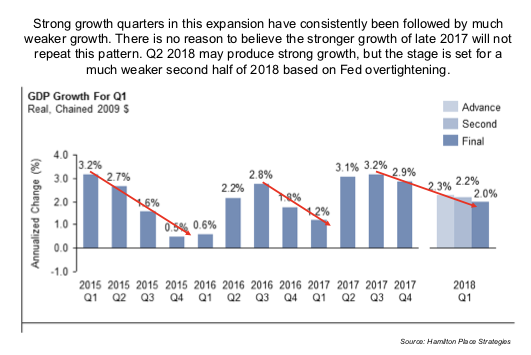 But by the first quarter of 2014, just six months later, growth was actually negative, -2.1%, comparable to some of the worst quarters in recent recessions. Growth was 5.0% in the third quarter of 2014, but then fell off a cliff and was barely positive, 0.2%, in the first quarter of 2015. You get the point. Strong quarters have been followed by much weaker quarters within six months on six separate occasions in the past nine years. There’s no reason to believe the second quarter of 2018 will be any different. The longer-term view of the entire recovery is more revealing. The recovery is currently 107 months old, the second-longest since the end of the Second World War. The average recovery since 1980 (a period of longer-than-average expansions) is 83 months. So this expansion has been extraordinarily long — 30% longer than average — indicating that a recession should be expected sooner rather than later. The current expansion does not even come close to that trend. The “wealth gap” (the difference between 3.2% trend growth and 2.1% actual growth) is now over $4 trillion. That’s how much poorer the U.S. economy is due to its inability to achieve sustainable trend growth. Into this mix of weak growth comes the Federal Reserve, which is tightening monetary policy, reducing the base money supply and supporting a strong dollar. All of these policies are associated with slower growth ahead, an inverted yield curve and a high probability of recession. The Fed is explicitly on a path of raising interest rates by 0.25% every March, June, September and December like clockwork unless one of three “pause” factors appears (disorderly markets, weak job creation or disinflation). Since none of the pause factors are apparent now, the Fed should be expected to raise rates in September and December 2018 and beyond. Simultaneously, the Fed is reducing its balance sheet (destroying base money) at an annual tempo that will reach $600 billion per year by end of 2018. This policy is completely unprecedented in the 105-year history of the Fed, so its economic effects are unknown. My estimate, and that of others, is that this balance sheet reduction policy is equivalent to four 0.25% rate hikes per year on top of the four already planned. The combined effect is the same as the Fed raising rates 2% per year off a near-zero rate base as recently as December 2015. Why is the Fed tightening if the economy is fundamentally weak and the probability of a recession is so high? There are two reasons. The first is that the Fed is using badly flawed models including the Phillips curve and a stochastic equilibrium macro model called FRB/US (or “Ferbus”). These models do not correspond to reality, but the Fed follows them anyway, which is why the Fed has never accurately forecasted a recession in its history. 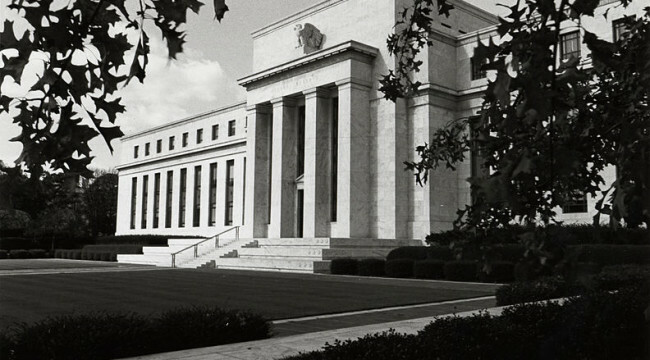 The second reason is that the Fed knows a recession will happen sooner rather than later and is desperate to acquire some dry powder (in the form of higher rates and a reduced balance sheet) so it can deploy rate cuts and QE when the time comes. The problem, of course, is that by pursuing these policies, the Fed will cause the recession it is preparing to cure. The single most important factor in my analysis is that when the Fed realizes its mistake of tightening into economic weakness, it will have to turn on a dime and shift to an easing policy. Easing will come first through forward guidance and pauses in the rate hike tempo, then possibly actual rate cuts back to zero and finally reversing their balance sheet reductions by expanding the balance sheet through QE4 if needed. When that happens, the dollar will crash and alternative currencies such as gold, silver and the euro will soar. Jay Powell seems determined to continue rate hikes on an aggressive path and possibly to accelerate the hikes. But he might be in for a severe case of whiplash when he has to make a hard pivot to easing. But by then, the damage will have been done.